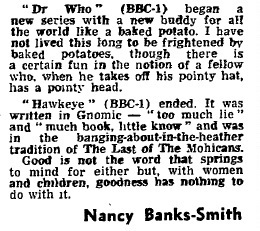 Dr Who" (BBC-1) began a new series with a new buddy for all the world like a baked potato. I have not lived this long to be frightened by baked potatoes, though there is a certain fun in the notion of a fellow who, when he takes off his pointy hat, has a pointy head. APA 6th ed. : Banks-Smith, Nancy (1973-12-17). A new buddy. The Guardian p. 8. MLA 7th ed. : Banks-Smith, Nancy. "A new buddy." The Guardian [add city] 1973-12-17, 8. Print. Turabian: Banks-Smith, Nancy. "A new buddy." The Guardian, 1973-12-17, section, 8 edition. This page was last modified on 18 November 2014, at 23:23.